LG’s unique G Flex, one of the first curved smartphones, received a must-appreciated update today with the G Flex 2. Put simply, the G Flex 2 offers faster internal hardware, a more sophisticated design, faster self-healing for the back panel, and is generally stronger (pretty typical as far as incremental device updates go). For the spec junkies, the G Flex 2 has a 5.5-inch 1080×1920 P-OLED display (that’s obviously curved), a Qualcomm Snapdragon 810 64-bit quad-core CPU, 2GB RAM, 16GB/32GB internal storage (with microSD expansion up to 2TB), 13MP rear-facing camera (2.1MP shooter on the front), 3,000mAh non-removable battery, and Android 5.0 “Lollipop.” And like other recent smartphone, its battery can be charged quite rapidly. LG claims you can get a 50% charge in just 40 minutes. It’ll also be available in two beautiful finishes: Platinum Silver and Flamenco Red. For more info, check out the press release below. 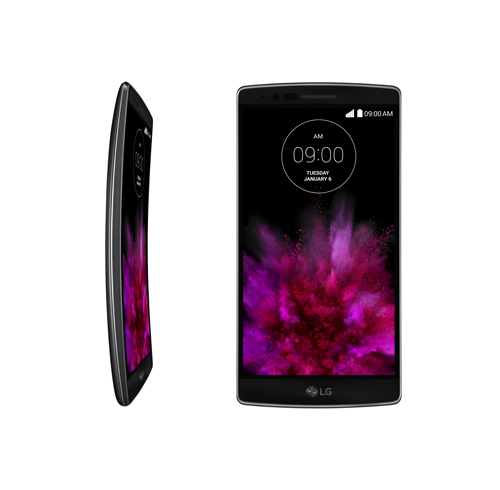 The G Flex2 goes beyond its predecessor’s groundbreaking 700mm radius curved profile. The new smartphone harmoniously incorporates a symphony of curves ranging from a radius of 400mm to 700mm across the front, back, sides and top-to-bottom edges.The dynamically curved layers deliver a sleeker and more dynamic look to G Flex2. The Self Healing back, which keeps the phone looking new even through the nicks and scratches from normal everyday use, has also been improved with significantly faster healing time. LG reduced the healing time from about three minutes to just with in ten seconds at room temperature. GlanceView displays key information such as time, recent messages or missed calls with a downward swipe of the curved screen even while the display is off.